In the recent months, S4 HANA embedded analytics has become a best suitable use case for some of the clients who wanted to perform operational analytics in real time with simplification not using BW EDW as a Separate system. Core data Services being the data modeling platform and fiori/Business objects as UI applications. In addition to CDS, there is an embedded BW content provided by SAP for reporting in S4 HANA. In this blog, I am going to talk about using BW embedded content for building some finance and controlling reports, these are going to be built on BW Cubes/multi providers instead of building on CDS views. SAP provided several standard BW objects(/ERP/*) with BW content for S4 HANA. Actually most of the SAP’s modeling content is in developed in CDS views, but there are few provided in BW models mainly for supplementing the Integrated planning(which is not covered in this document), however operational reports can also be built on them. Let us start with an example. Example: Requirement is to perform a Cost Center Actual Vs Plan data analysis in S4 HANA system. For this, SAP provided a standard BW cube and Multi provider and BEx query. BEx queries are the data sources for both fiori report and Analysis for office work book configurations. So there is no CDS involved in this data model. It is very powerful, because, BW master data attributes, text and hierarchies leveraged in reporting. Also, Simple to configure over CDS model development. I will explain the concept in a little detailed way. Prerequisite: Embedded BW content is Activated in the S4 HANA system, a detailed step by step guide is provided SAP note 1972819. After activation, the Standard BW content is available in the RSA1 transaction, Info area name is /ERP/FMCO, in this there are several sub info areas for finance and controlling with the required info provides as shown in below picture. At this moment, it is just a validation of existence of required objects. Cost Center Actual Vs Plan analysis is the required one, so I search in fiori library for online documentation with this subject, link is below. 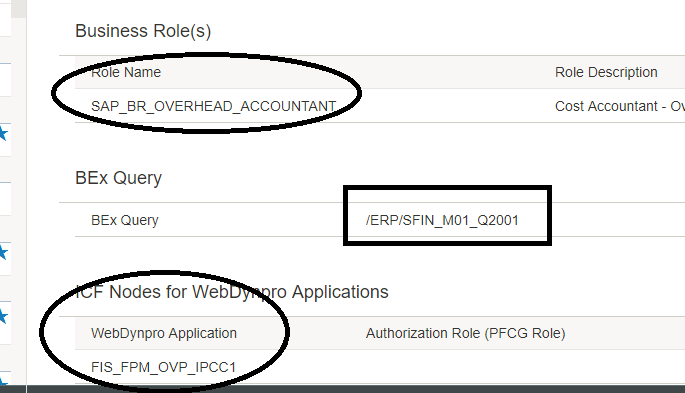 Once found, it gives more more information about the fiori report, what is the business role required, BEx query name and Web dynpro name to build the fiori report. Can be seen in the below picture. if we are going to customize the fiori report given by SAP this information helps in where to go. However, in this document, my focus is to customize the BEx query for Analysis office work book on top of BEx query. Now we got the BEx query name, /ERP/SFIN_M01_Q2001, we can find the underlying info provider (/ERP/COOM_M01), this multi provider contains several infocubes, Cost Center Actual (/ERP_COOM_V04), also some other ones like Internal Order Actual/Plan and SKFs. For this report, only Cost Center actual/Plan is required, by reviewing the BEx query definition we can understand how it is built and customize further. Data Process: How the data is coming through to BEx report, below diagram explains the data flow. We can notice that, in 2 different ways data flows are developed. Embedded BW content for new S4 HANA finance tables like ACDOCA, SAP provided a Native HANA calculation views on ACDOCA and also some master data tables, these calculation views will become the datasources to the BW Virtual Cube and master data objects. Then, queries are created on top of the virtual providers. Calculation view name: FCO_C_IBP_ACDOCA, It is accessed in HANA native modeling prospective or HANA Web Workbench. 2. Embedded BW content for traditional ERP tables like COSP and COSS for Cost center reporting, ABAP class/methods are provided by SAP to call the SAP Extractors/Datasources, they further access the extractor logic to read the data from ERP tables. To get more information, access class in SE24, method QUERY READ, we can understand the ABAP code on how it is reading the data from Extractors. Lastly, Concluding that, with these 2 options in Embedded BW in S4 HANA, data extraction and harmonization logic is already taken care by SAP, it is very flexible option. Of course, it is a light modeling, but it can be a good fit to the customer who wants some standard reporting on ERP data. This SAP models can be customized further depending the scope, however customization of calculation views or ABAP class is not covered in this document.